It is sometimes exciting to go back a couple of decades and think about what was an intellectual topic at the time. The film, Galaxy Quest, from 1999 did this to me recently. The 80s and the 90s were decades of talking about hyper-reality as Jean Baudrillard had introduced: The inability of consciousness to distinguish reality from (even disloyal) reproduction of reality – mostly in media. The reality of images we are exposed to become more “real” than what is called in philosophy ‘objective reality’. It is easy for us now to talk about the possibility of human mentality constructed of/by virtual reality as we live in the era of online games, Facebook and Twitter. Interactive media are now creating a parallel reality to which a new form of subject has accommodated. However, in the 90s the hyperreality was believed to be creating by mass media (e.g. CNN) and Hollywood (e.g. Star Trek). 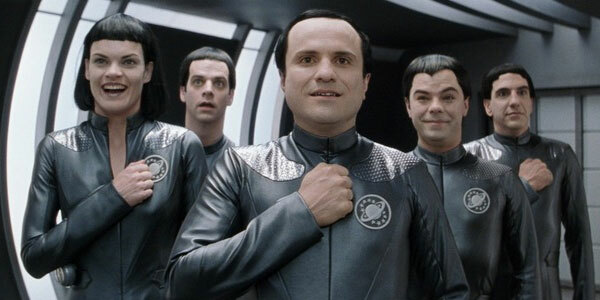 Galaxy Quest’s way of tackling hyperreality is complex and multi-layered. Mainly, it is a parody not like most of other parodies. Not only does it parody the form and content of Sci-fi films, but it also satirises the fans of such genre; those who live the hyperreality of Star Trek’s world that is perceived more authentic and original (or just pleasurable) than the objective reality. Textually speaking, on the one hand, some aliens –the Thermians – happen to watch the Galaxy Quest show. They so much believe the ‘simulation’ that they build a world identical to what they watched. In fact, the simulation (aka hyper-reality) seems more meaningful than their own pre-exposed reality (-they often remember the misery of life before the show). In their hyper-real world, which is unbelievably real to them, they imagine the same stream of life and success as they watched on the ‘historical documents’, i.e. the show. They can metaphorically illustrate the fanaticism of subjects towards the hyper-reality of media’s images. On the other hand, there are huge gatherings of the Galaxy Quest’s fans who wear the characters’ costumes and stand in lines to meet their heroes and get an autograph. They talk to their favourite characters about their lives in that show and that show in their lives. The Thermians do the same and attend one of these events since they are of the same quality as other fans of the show: all live with-in this world, or in other words, the hyper-reality is more relevant and valid to them than the objective reality. This is where you cannot keep on separating these two realms (if there can be found two separate realms anymore). At another level, the epistemological universe of the Thermians, and Brandon and his friends are in parallel stances: the Thermians are so attached to the hyper-reality that they already reject any other possibilities of reality (most importantly, the ‘psychological resistance‘ that their leader show while being tortured/treated in a situation resembling to a psychiatric bed). Similarly, Brandon and his friends are so devoted to solve the scientific mysteries of the spaceship that they created their own simulation of the simulation: the platonic extension of hyper-reality. For both, the hyper-reality in which they live may not raise any ontological questions; a world without an original state of being, though it –(hyper)really – exists! In general, the film reminded me of the speculations in the 90s about the future of living in hyper-reality and its consequences for human lives. Now in the early 2017, it is like a memory of childhood; today we are not anymore ‘significant’ outside the representations of ours in hyper-reality. We are creating our own reality and the borders between reality and hyper-reality seem to have been blurred a long time ago. However, watching a parody of the beginning of our today’s (hyper)reality is a phenomenological education! A parody, unlike other parodies, that aims at the audiences of a genre than the genre itself. P.S. I need to appreciate Cliff and Mee Wun who invited my wife and I over to watch this film. آنگ سانگ سوچی الگوی ما بود برای مبارزه با استبداد حاکم بر ایران؛ همیشه به بزرگان و رهبران دموکراسی خواهی، نمونه مقاومت سوچی را گوشزد می کردیم. حتی زمانی که سوچی از تحریم های بین المللی علیه حکومتِ وقتِ میانمار دفاع کرد، احترامم به او بیشتر شد و افسوس خوردم که چرا رهبران دموکراسی خواه ایرانی وارد دیالوگ با رهبران غربی نمی شوند. اما برخی زود جایزه صلح نوبل می گیرند! حالا در حالیکه آن تصویرِ سوچی را بیاد می آورم این چند خط را می نویسم. و دقیقاً آن تصویر است که وادارم می کند همین چند خط را بنویسم. حدوداً هشت ماه است که سوچی پیروز شده و حزبش دولت میانمار را تشکیل داده است. با این همه، اخیراً ارتش میانمار در حال نسل کشی مسلمانان روهینگیا ست. گزارشهای سازمان های مستقل، نهادهای حقوق بشر و نمایندگان سازمان ملل هم حکایت از نسل کشی، شکنجه زنان و کودکان، آتش زدن روستاها، و کوچ اجباری اهالی این منطقه دارد. عملیات نظامی پاسخی به حملات تروریست ها علیه نیروهای امنیتی و دولتی است. It is always difficult for me to call a(n older) person by her/his first name at the first meeting. The intricacies of addressing have been discussed in different disciplines and there is a good amount of literature in this area (for an overview see this book). The hierarchical society imposes some conceptual scripts that you just can’t help. I had overcome the issue with older/high-ranking men whenever I had to address them (by their first names). However, the issue remained unchanged with older/high-ranking women. There was always something stopping me from addressing them in anyway except a title plus the last name. A couple of years of living in Poland, I believe, worsened the issue; since Poles are stricter in this respect than Iranians. I’ve been advised to take the Australian way of addressing. Actually, I’ve always believed that the system of hierarchy we have in many countries in the world -including Iran- doesn’t entail any moral values (or superiority) per se. Besides, I’ve always considered myself an ironist (in Rorty’s terminology) who believes in the contingency of his ‘final vocabulary’. However, (and surprisingly,) I feel uncomfortable to swap two arbitrary forms of conceptualisation. Happily though, I lack any ideological inclinations, except the belief in the ethics of a liberal subject (with regard to Judith Shklar’s definition). But, now, I am able to understand how difficult integration is for those with a large body of engrained arbitrary beliefs and ideas. So, I’ll try my best to prove to myself that what I practise is not the antithesis of the philosophy I preach! and I would call you ‘in the Australian way’, even though it might be (and is) a bit difficult in the beginning. How does an ironist’s blog look like? I just changed the tagline to the title of my blog. It used to be ‘a personal blog’ in Farsi and now it is ‘an ironist’s personal blog’. I changed it because of two reasons which are at different levels turning points in my life as a casual blogger. “I shall define an “ironist” as someone who fulfills three conditions: (I) She has radical and continuing doubts about the final vocabulary she currently uses, because she has been impressed by other vocabularies, vocabularies taken as final by people or books she has encountered; (2) she realizes that argument phrased in her present vocabulary can neither underwrite nor dissolve these doubts; (3) insofar as she philosophizes about her situation, she does not think that her vocabulary is closer to reality than others, that it is in touch with a power not herself” (in Contingency, Irony, and Solidarity; p. 73). Second, we are at a shifting point in human history. 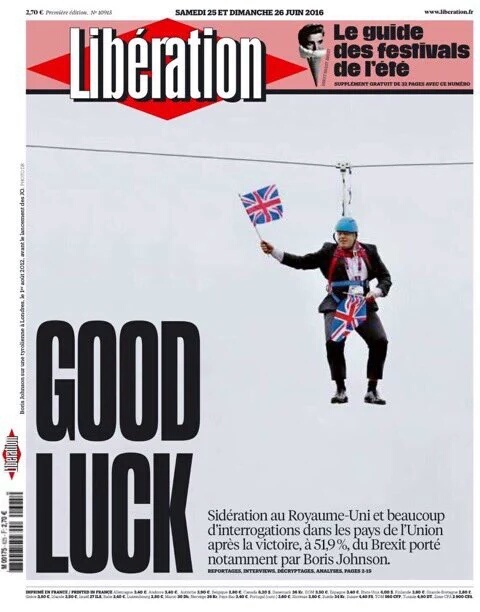 I am not so pessimistic that I could think illiberal forces are about to conquer the world. However, I believe, in fact, only a minority of people who voted for Trump, Brexit, etc. are illiberal. Thus, I am determined to reflect on how I see the world. To me, it’s not meant to be read widely (while I’ll be humbled and happy every time somebody is reading my notes), but I’m more determined to keep my diaries of these days. Initially I wanted to create another blog, then I felt that I would miss all years of writing in Farsi on this address. Therefore, I’ll keep them and base my future writings upon all those ideas. They might be in another language/world, they built who I am now, though. شاید بهترین تصویر از وضعیتی کنونی بریتانیا را ترکیب عکس و تیتر اول امروز «لیبراسیون» بیان کند. تصویری از بوریس جانسون –آن زمان به عنوان شهردار لندن – که هنگام المپیک لندن در سال ۲۰۱۲ خواست مثل همیشه خوشمزگی کند و در بالای آن سیم، میان زمین و هوا مدتی گیر کرد. بوریس جانسون به شوخ طبعی اشتهار دارد. همیشه به طنز، کنایه، و آیرونی صحبت می‌کند. پیش از ماجرای خروج بریتانیا از اتحادیه اروپا، هر وقتی که او را (چه در مقام شهردار لندن و چه نماینده پارلمان) می‌دیدید، داشت صحنه‌ای از کمدی‌های یونانی اجرا می‌کرد. روزنامه دیلی میل که می‌خواهد او را توصیف کند می‌نویسد او شخصیتی همچون «بافون»* دارد؛ یعنی مثل یکی از شخصیت‌های کمدی کلاسیک یونانی. کمدی یونانی سه شخصیت ثابت داشت، که یکی همین «بافون» که مضحک بود، زبان تندی داشت اما به شدت سرگرم کننده بود. دیگری «آیرون»** بود که خردمندی بود که تظاهر می‌کرد کمتر می‌داند و همیشه شخصیت سوم و پرمدعای کمدی یونانی را شکست می‌داد و کلمه «آیرونی» *** هم از آن آمده است. نوع طنزی که «آیرون» ارائه می‌کرد، پهلو می‌زند به آن آیرونی و طنز خردمندانه‌ای که سقراط به کار می‌گرفت. بوریس جانسون هم در آکسفورد کلاسیک‌ها را خوانده است و احتمالاً تفاوت این دو را به خوبی می‌داند. برخلاف آیرون، آنچه برای بوفان مهم است سرگرم کردن دیگران است. اتفاقاً حتی هنگامی که عکس فوق از بوریس را گرفته شد، باز هم مشغول سرگرم کردن حضار و ترغیب آن‌ها بود. با این همه، جمعه صبح – پس از رفراندوم خروج از اتحادیه – که بوریس از منزلش در شمال لندن خارج شد، با مردمی مواجه شد که به جای قهقه زدن از راه رفتن و حرف زدنش، او را هو کردند. بوریس اول متعجب بود. بعد کم کم چهره‌اش غرق در ناباوری شد، و بعد بر سرعتش افزود و به سمت ماشینش دوید. چه بوریس تا آخر تابستان نخست وزیر بشود یا نه، نماد بریتانیای کنونی است. بافون، شوخی را از حد گذرانده. رفته بر سیمی باریک و یک شوخی خرکی کرده است. درست است که برخی هنوز هم می‌خندند و اما دیگران از این شوخی برآشفته‌اند چون پرچم بریتانیا را هم با خودش بر بالای سیم برده است. بافون حالا بر سیم باریک گیر کرده و نمی‌داند چه می‌شود. ممکن است سالم به سر سیم برسد و پایش را بر زمین بگذراد، اما متاسفانه آن سمت سیم که شیب هم به آن طرف است، ارتباطش توسط خود بوریس قطع شده است و آن طرفی‌ها فریاد می‌زنند «موفق باشی» (تیتر لیبراسیون). حالا بوریس باید گیرِ سیم را آزاد کند، باید خلافِ شیبِ سیم حرکت کند، و تازه شاید پایش را سالم بر زمین بگذارد. اگر چنین شود، اولاً بوریس دوباره پایش صحیح و سالم بر زمین است، ثانیاً بافون دوباره می‌تواند حضار را بخنداند، و ثالثاً آن پرچم‌های بریتانیا که توی دست‌های بوریس/بافون است دوباره به سرجای خودشان بر می‌گردند. خلاصه اگر بوریس نتواند مخاطبانش را بخنداند، چیزی می‌شود همچون ترامپ. و این نه فقط بخاطر این است که هر دو مو‌ها و صورتی شبیه به هم دارند و این را مطبوعات بریتانیا دست گرفته‌اند. پی نوشت: امروز برخی از همکارانش و ناظران می‌گویند، بوریس فکر نمی‌کرد برنده شوند. فقط می‌خواست حرکت و جنبشی ایجاد کند. شوخی بافون از حد در رفته و خودش مبهوت است. به نظر اول باید چند مصداق برای رفتار ضداجتماعی برشمرد. رفتار ضد اجتماعی، رفتار و رویکردی خلافِ عرف به دیگران است که به انسجام جمعی ضربه می‌زند. مثلاً نظرهای راستگرایانه، ملی گرایانه، و نژادپرستانه مدتهاست که [بیشتر] در بخش اروپایی و آمریکایی شبکه‌های اجتماعی در کامنتها و پست‌ها قابل رصد است. زیر پست‌های اکثر رسانه‌های غربی در فیسبوک، توئیتر و… می‌توان حضور قابل توجهی از این گفتمان را حس کرد. احتمالاً در همین راستا، نمود چنین گفتمانی را می‌توان در رأی (بخش قابل توجهی از) افراد به ترامپ در آمریکا، حزب آلترناتیو در آلمان، جبهه ملی در فرانسه، حزب آزادی در اتریش، حزب قانون و عدالت در لهستان، حزب مردم در دانمارک، و… جستجو کرد. پلیس بریتانیا در سال ۲۰۱۴ اعلام کرد که نیمی از تماس‌های مردمی با پلیس به علتِ گزارش تعرض و رفتار ضداجتماعی، مربوط به جرائم شبکه‌های اجتماعی (عمدتاً فیسبوک و توئیتر) بوده است. در فضای مجازی فارسی هم موارد رفتار ضداجتماعی کم نیست. مواردی که ما به شخصه هر روز با آن مواجه هستیم: از حمله به صفحات افراد ایرانی و غیرایرانی صاحب شهرت گرفته تا کامنتهای پر از فحاشی و اهانت در صفحات عمومی این شبکه‌ها، از درگیری‌ها با دیگر ملت‌ها (بخصوص همسایه) تا درگیری‌هایی که بین افراد وابسته به قومیت‌های حاضر در مرزهای ایران، گاهی علیه همدیگر (مثلاً کشاکش‌های‌ گاه و بی‌گاه تورکهای ایرانی و کرد‌ها)، و گاهی علیه مرکرنشینانِ مرکزگرا (عرب‌ها، تورک‌ها، و… علیه آنچه “فارس‌ها” می خوانند). از طرفی دیگر، سه فقره از اخیر‌ترین مواردی که منجر به انعکاسی جهانی شد: اول، قتل نماینده پارلمان بریتانیا “جو کاکس” که به گزارش گاردین به طور مرتب در شبکه‌های اجتماعی مورد تهدید و توهین قرار می‌گرفت. دوم، زد و خوردهای کم سابقه در جام ملت‌های اروپا در فرانسه که مدت‌ها بود در شبکه‌های اجتماعی به صورت کلامی در جریان بود. سوم، حمله به کلوب همجنسگرایان در فلوریدا که نه تنها مدت هاست در شبکه‌های اجتماعی جریان دارد (برای مثال می‌توانید کامنتهای اهالی ایران و افغانستان را در ذیل خبرهای این رویداد در فیسبوک بخوانید – یا حتی نظرات دیگر محافظه کاران مذهبی درباب دگرباشان در کشورهای مختلف)، بلکه شخص قاتل نیز به توا‌تر چنین مطالبی را در شبکه‌های اجتماعی منتشر کرده بود. اینکه چه عواملِ روان‌شناختی باعث می‌شود افراد در شبکه‌های اجتماعی، بدون تردید، شرم، و مانع، رفتار ضد اجتماعی نشان دهند محل بحث من نیست. اینکه تفاوت رفتارِ ضداجتماعیِ «کلامی-نوشتاری» با چنین رفتاری به صورتِ «غیرکلامی» چیست نیز با اینکه مورد علاقه من است اما اینجا محلی برای پرداخت ندارد. به نظر من، پاسخ در مکانیزم‌های «مراقبت و تنبیه» است. سازوکارهای کنترلی که جوامع در طول تاریخ بشر به آن‌ها دست یافته‌اند. تاریخ بشر محشون از صحنه‌هایی تاریک از سبعیت و تخریب (خویش) است. چنین سازوکارهایی، جوامع بشری را پلیسی کرده‌اند تا افراد ملزم به زندگی در درون قراردادهای اجتماعی شوند. نهادهایی در جامعه اختصاص یافته‌اند تا افراد را “تربیت” کرده و مضارِ رفتارهای ضداجتماعی را آموزش دهند. نهادهایی رفتارهای ضداجتماعی را رصد می‌کنند و نهادهایی نیز با هرگونه رفتار ضداجتماعی رصد شده برخورد می‌کنند. به طور خلاصه، شبکه‌های اجتماعی فاقد این سازوکار (و نهادهای) پلیسی هستند. چنین فقدانی، کاربران انسانیِ آن‌ها را در وضعیتی شبه-طبیعی قرار داده تا «گرگ-انسان»‌ها جولان دهند. پس احتمالاً کم کم بشر، قراردادهایی درباب این شبکه‌های تدوین خواهد کرد و نهادهای «مراقبت و تنبیه» برپا خواهد کرد (اخیراً فیسبوک، توئیتر، یوتیوب و مایکروسافت مسئولیتِ [برخورد با] مطالب منتشر شده در این شبکه ها را پذیرفته‌اند- لینک). من تعمداً از لفظ «پلیسی شدن» استفاده می‌کنم. زیرا برایم بسیار غم انگیز است که – به ظاهر- تنها راه برخورد با رفتارهای ضداجتماعی «مراقبت و تنبیه» است. همچنین، اسفبار است که تجربه‌های «آزادیِ خود-انگیخته»ی بشر همیشه شکست می‌خورند. همیشه، خیلی زود، آزادی دود می‌شود، به هوا می رود، و ابرهای مراقبت و کنترل را شکل می‌دهد. تابستان پارسال بود. خسته و داغان از یک روز پیاده روی در زیر آفتابِ جزیره‌ی بیوک آدا، دم غروب سوار یک کشتی شدم که به استانبول برگردم. طبقه بالا، در فضای باز نشستم. کشتی آرام بود و کم مسافر. کشتی راه افتاد و من در گوشه محوطه باز طبقه بالا لم دادم. از آن طرف تر چهار مرد جوان با فریاد به دنبال هم می‌دویدند. آنکه جلوتر می‌دوید به زبان عربی، فحشی به عقبی‌ها داد و قاه قاه خندید و تندتر دوید. عقبی‌ها بیشتر تحریک شدند. یکی‌شان دمپاییِ پایش را در آورد و پرتاب کرد. دمپایی از مقابل صورت من که در گوشه راست طبقه‌ی دوم کشتی نشسته بودم رد شد و افتاد بر موج‌های دریای مرمره. آنکه از همه چاق‌تر بود و عقب‌تر از همه می‌دوید، هنگامی که از مقابلم گذشت گفت “آسف” و رفت. بنابراین، احتمالاً کار مرحوم نجفی (و بسیاری دیگر) هم نوعی از بسطِ تجربه‌ی نبوی است. عبدالکریم سروش مقاله‌ای نوشته در ادامه‌ی بحثش درباب اینکه قرآن، کلام محمد است و صورتی از رؤیا و خیالی که بر محمد وارد شده است. بحث در مورد نظر او، نه در حد توان و وسع دانش من است و نه علاقه‌ای به پیگیری الهیات دارم. اما سبک بلاغی که سال‌هاست در میانِ نویسندگان و سخنواران ایرانی بسیار باب بوده و در نوشته[ها]ی سروش نیز موج می زند، توجهم را جلب کرد. سروش آشکارا در جای جای متنش استدلال می‌کند. جنس استدلالاتی که ارائه می‌کند به مقتضای مباحث کلامی و الهیات، نوعی از تفسیر است. اتفاقاً جنس تفسیرش هم نوعی از نقد ادبی و تأویل زبانشناختی است. از قضا، سروش بسیاری از فنون تحلیل گفتمان (که قبلاً توسط غربی‌ها بر متون مذهبی اعمال شده‌) را به کار می‌گیرد تا به مراد رسد. مثلاً از عدم انسجام و گسستِ روایی در آخرین آیه نازله بر محمّد (آیه سوم سوره مائده) می‌نویسد، یا استفاده از صیغه ماضی در توصیفات قرآن از ماوراءطبیعت، و یا استعاره‌ها و مجازهای قرآن (ذهن محمّد) را تحلیل می‌کند. آنچه سروش می‌کند، بسیار مدرن‌تر از آن چیزهایی است که متألهین از هرمنوتیک کلاسیک آموخته‌اند. آشکارا همنوا با فنون اخیر زبان شناسی، تحلیل گفتمان و … . به زغم این، متفکرینی مثل سروش معمولاً به این مطلب تصدیق نمی‌کنند و حداکثر اشاره‌ی کوچکی به کلاسیک‌ها (مثلاً دیلتای یا شلایماخر) می‌کنند. به طور کلی [برخی از] متفکرین فارسی زبان، برعکس همنوعان غربی‌شان، به این متون علمی که چنین چارچوب‌های نظری و تحلیلی را به وجود آورده‌اند ارجاع نمی‌دهند (نه در مقالات و نه در کتب شان). در عوض، پس از هر استدلال، شاهدی منظوم از مولوی، حافظ، سعدی و … می‌آورند. پنداری عصاره‌ی صادقه‌ی معرفتِ بشری در این ابیات است و اگر شاهدی آوردی، میخ آخر را بر تابوتِ ناهیانِ ممکن زده‌ای. و اتفاقاً در فضای بین الاذهانیِ گویشوران زبان فارسی، ارائه‌ی چنین شهادت‌های منظومی بسیار لذت بخش است. نه تنها سخنور (یا مؤلف) پس از این چنین بیتی مشعوف می‌شود و اندکی سکوت می‌کند تا تحسین مخاطبانش را با حرکات سرهایشان و نیش‌های بازشان – در اثر محظوظ شدن از این همه ردیف کردن بیت‌ها- ببیند، که معیارِ نوشتارِ فاخر هم چنین پراندنِ ابیاتِ حفظ شده در میانه‌ی استدلالِ کلامی است.